It's a rare thing indeed when my son and daughter (ages 3 & 6) are both equally engaged in the same book, but it has been achieved with the The Day the Crayons Quit. The kids giggled, guffawed, snickered, went to get their own well-loved crayons to hold while listening to me read, and then wanted an encore presentation immediately upon reaching the end. 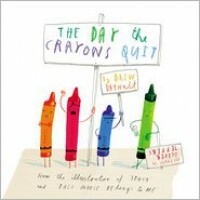 The creative premise, the charming illustrations, the hilarious individual letters from the crayons-on-strike all served to make this gamble from the library a book we're now buying for our favorites shelf.